Why have a hatch back when you can have an estate car? Not so many years ago the answer was easier to define as estate cars tended to be bulky to achieve a serious advance on load space and it has taken a good deal of motor industry resources to gain interior space while saving on exterior dimensions. Today’s car design trends clearly prove this space without bulk gain, no more so than the latest 4th generation Golf Estate (based on the 6th generation Golf hatch back) I have been testing in eco-friendly 1.6-litre Blue Motion form. A vehicle that has been clearly developed to attract those with that 'want not waste not' attitude to their motoring budget and also to leave the UK taxman with zero take on road tax, at least for the first year. 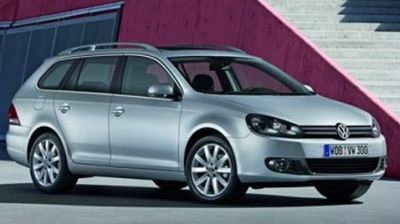 Of course, the Golf hatch back that has grown in size (and stature with over 26 million buyers) is the iconic version but has spawned innovative variants including the open topped Eos, Jetta saloon, the slightly loftier Golf Plus and this latest estate version. Whatever Estate variant one chooses from a long line-up, it is clearly evident to me that there is no compromise, this estate version measures only 336 mm longer than the hatch back but can swallow 505 litres of ‘cargo’ with all seats in place compared to 350 litres in the hatch back and a really useful 1,495 with both split fold rear seats flat – max load length is up to a useful 1.70 m. A load though hatch is also standard on all versions. This scant size differential has resulted in a smart smooth-lined body style, the practical aspect only suggested by the presence of the roof rails, a new design in its entirety though clearly a member of the Golf family when viewed from the front. From the comfortable driving seat there is the ambience of the Golf, the bench mark build quality and finish and the clearly defined instruments with familiar blue back lighting though design varies a little but style, layout and tasteful choice of trim materials confirm the Volkswagen DNA – would you believe the car is sourced from Mexico? Creating an estate from either a hatch back or a saloon design has not always been successful when it comes to retaining driving character though successive Golf Estates have come off well as a worthy performer for the discerning driver as well as an easy going and safe vehicle for the more general sort of driver. These good road manners result from a well honed fully independent suspension system that imparts excellent road grip (aided by traction control, electronic differential lock and stability control, plus an all disc braking system with both ABS anti-lock and HBA hydraulic brake assist and speed dependent power assisted steering. The Blue Motion treatment that involves a weight saving ‘diet’, revised high gear ratios, low energy tyres and more, has sparked a lot of debate as an alternative to hybrid technology and when one considers the official combined consumption of 63 mpg and an urban figure of 54.3 mpg, giving a range of around 800 miles on a tank full of diesel then this particular version has a strong case. Miserly it might be on fuel consumption and exhaust emissions (only 109 g/km) but this 1.6-litre engine punches well above its weight by producing a very competitive 103 bhp in a very dignified manner to provide a claimed top speed of 118 mph with 62 mph (100 kph) reached in a respectable 11.9 seconds. The five speed gearbox is a positive and light acting device ideal for exploiting the power delivery to the full though there is plenty of power flexibility to suit the lazier driver – or they could opt for the optional DSG double clutch selectable automatic unit. Undoubtedly the serious driver miser could extract more mileage by ensuring the stop+start system is used at every opportunity – it only requires selection of neutral to cut the engine and a depression of the clutch to restart. A regenerative system operates under braking to ensure the battery is kept charged. I would add that this system could contribute to less driver stress when grappling with severe traffic congestion. This Blue Motion version is based on the near top SE specification and comes extensively equipped, not just with the usual goodies like powered windows but with powered and heated mirrors, an air conditioning system that switches to re-cycle whenever reverse gear is selected or the windscreen washers are operated (thus avoiding fumes or the nasty aroma of washer fluid), a cocoon of airbags, automatic coming and leaving headlights system, cruise control, ISDOFIX child seat preparation, automatic driving lights, rain sensor wipers and much more. Options include a rear view camera (a first for this class of car?) at £160 though linked to a £1,445 satellite navigation system. Not only a very competent and smart act but I suggest a serious proposition for a wide customer base…those wanting to size down a bit with no lifestyle sacrifices or a sage junior executive looking to get more for less? Rivals include: Vauxhall Astra Estate, Peugeot 308 SW, Ford Focus Estate, Renault Megane Tourer. Insurance rating: 18E. Price: £19,880.